After Sunset Waya we took the yellow Yasawa flyer boat north past the blue lagoon to Tavewa. 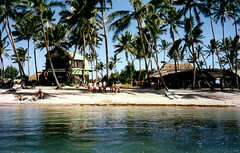 We found our way across to Nacula island, and Oarsman’s Bay lodge. Oarsman’s had 3 course dinners, fans, hammocks, electricity, hot showers and absolutely everything Sunset Waya didn’t in terms of luxuries. Still it only cost about $35 USD per person a night (including meals). However, this is probably going to go up. Oarsman’s is aiming for a more expensive market, and just keeping the price low while they are ironing out the start-up bugs. What Oarman’s had in technicalities, Waya more than made up for with it’s friendly people and primitive and careless lifestyle. Should I go back to Fiji, I think I would have aimed for Waya, not Oarsmam’s. I logged 6 dives while at Oarsman’s, including a night dive. Yasawa Diving have the coolest dive boat ever. Two 200hp outboard engines on the back make it fly. We took a 6-seater seaplane (Cessna 206) back to Viti Levu. And from there we went to Robinson Crusoe Island for Christmas. Crusoe Island caters for younger, activity seeking people. But at least it is not as bad as Beachcomber island (think a tiny Temptation Island, just with more booze). We had a good Christmas there with some Swedish people. We even walked around the Christmas tree and sung Scandinavian carols. While at Crusoe I logged another 6 dives with Scuba Bula on Viti Levu (they came and picked me up in a tiny boat in the mornings). However, the wildest sighting while diving with them was (thankfully) not underwater. We were cruising along to our next dive site when we saw the sea boiling. Heaps of smaller fish were jumping out of the water. An enormous school of tuna was feeding off the smaller fish. But that’s not all. This was a shark feeding frenzy too. We could see at least 10 – 15 large sharks feeding off the tuna. We could clearly see them from the boat, and we also took our masks and peeked into the water. Bull-sharks, nurse-sharks and reed sharks all having a huge party. Scary stuff, but luckily we only saw reef sharks in our dive afterwards. But in the end we made it safely back to Australia. This entry was posted in South Pacific by Bogsnes. Bookmark the permalink.